This issue highlights the agenda for global mobility and many businesses and industry sectors. we explore some of the companies like Aston Martin who are finding solutions in a new location. Inclusion and diversity are increasingly being recognised as core to the business agenda to not only help fill skills gaps by accessing untapped talent but to ensure real diversity of thinking to support growth. Find out more to stay ahead. Discover how to enter the Think Relocate Awards and read about our exciting events for 2019. The January 2019 issue of Relocate magazine is available now in both print and digital format.As we embrace the new year it is good to reflect on what came out of the conferences in the autumn which help to set the agenda for many disciplines across global mobility and highlight the priorities of different industries for 2019. Many sectors will continue to ride the waves of change caused by technology, disruptors and global and local political, economic and social influences. 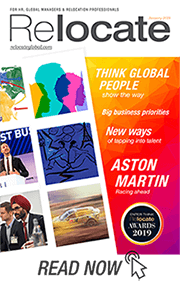 In this edition we explore some of the companies like Aston Martin who are finding solutions in a new location.Inclusion and diversity are increasingly being recognised as core to the business agenda to not only help fill skills gaps by accessing untapped talent but to ensure respect for all individuals from which flows real diversity of thinking. Relocate Global’s new communities will also support readers at different stages of their individual and organisational journey.As we widen the appeal of Relocate Global across international management with more emphasis on putting global people at the heart of decision making and leadership, we invite you to enter the Relocate Awards and showcase your achievements and innovations. Please join us at the Festival of Global People to be held on the 14 & 15 May at the St Pancras Renaissance Hotel in London to interact with colleagues and experts and explore some of the cutting edge ideas that are shaping growing organisations and supporting their employees to flourish. Think Relocate Awards – Enter now! Boarding a modern option for all parents? For advertising enquiries across the Relocate media, call Simone Yildiz or Sue Deacon on +44 (0)1892 891334, or email ads@relocatemagazine.com. Let us know if you have ideas for features, surveys or events, and keep us informed of your company’s news by emailing editorial@relocatemagazine.com. Access hundreds of global services and suppliers in our Online DirectoryRelocate’s new Global Mobility Toolkit provides free information, practical advice and support for HR, global mobility managers and global teams operating overseas.